This area will contain the decisions by the Board of Directors to questions posed regarding a rule clarification to the current rules. These are posted on SlotBlog but we realize that not everyone will visit that site for information. Any previous decisions have already been included in the rules. I would like to know whether or not zapping those motors is against the above rules. A: With the wide variances in FK magnet strength and gauss numbers rendered by different brand gauss meters, there is no conclusive way to prove a motor has been zapped or has had the magnet strength purposely lowered, so zapping cannot be considered a violation of the above regulation. In accordance of the IRRA™ policy of periodically checking approved motors to verify specs, a motor from the latest batch of the JK Retro Hawk (JKHR) has been found to be in compliance, i.e. the same 65 turns and the same coil resistance as submitted motors and the original batch. Q: Can the excess plastic below the bumper line be left to act as a spoiler on Stock Car bodies such as the Cyclone and the Torino? A: No. While the real 1:1 cars may have had spoilers attached or under behind the bumper, unless the this was molded into the body then the body must be trimmed at the front and the rear at the trim line. The current rule also states that no spoilers may be added. Q: Will IRRA® reconsider the rule about no tape on the bottom of the chassis this year? 1. 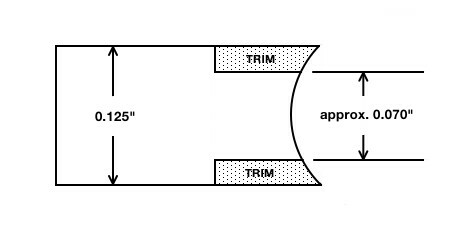 Tape on the bottom of a chassis would be material hanging below the main rails and thus violate a provision of the chassis construction rules. 2. Not all tape is affixed well enough not to cause the frame to be below clearance standards. 3. Tape on the bottom of a chassis can come loose and cause launching problems. 4. Permitting tape on the bottom of chassis would require specifying what kind of tape(s) and how many layers would be permitted. 5. Removing heavier tapes, such as lead tape, from the bottom of the chassis easily could be used to reduce a car's weight after tech. Q: Can we get rid of the seal on PD motors to save on the refurb cost to freshen-up the motor? A: IRRA® remains committed to a "no working on motors" policy and thus the requirement for sealed PD motors that can only be opened by an approved IRRA® Motor Refurbisher will remain in place. Q: In section 2b of the IRRA® Can-Am rules under body it states that “the front wheel arches must be cut out”. Several racers are cutting small holes and/or slots and not fully cutting out the front wheel arches. The rules do not state a size or guideline. Can you clarify?? A: Since IRRA® wishes to define “slot cars that reflect the appearance of actual racing cars of the ’60s,” the front wheel arches must be cut out full width, with the top of the wheel arch located above the axle at least 50% of the distance between the axle and the top of the wheel/tire. 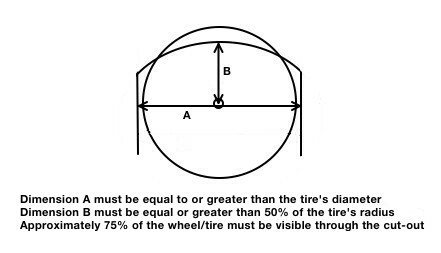 Approximately 75% of the wheel/tire must be visible through the cut-out; no visual obstruction of any kind across either front wheel can be seen when viewing the car from its sides. Q: Since it has been determined that the PS-FK motor allowed in Can-Am Plus may have issues starting and need a push due to the size of the brushes and the diameter of the comm, can the motor brushes be modified to eliminate this problem? A: Yes, in Can-Am Plus, the brushes in Pro Slot FK motors may be modified as shown in this diagram. Q: When racing under IRRA® rules, is a car that loses a wheel or tire, front or rear, subject to a black flag for repair or may it continue racing? Any car suffering damage that makes it a hazard to other drivers, due to constant de-slotting, or that is damaged in a manner making it illegal under IRRA® rules (such as a loss of part of the body, loss of interior, or dragging on the track surface) will be black-flagged. A car that is black-flagged must be immediately removed from the track until proper repairs are made. Failure to comply with a black flag will result in the driver’s disqualification from the race. Though not specifically stated in the above regulation, yes, under IRRA® rules a car is required to have four wheels and tires. If a car loses a wheel or tire, front or rear, while racing, the black flag rule applies and the car must be removed from the track to have the wheel/tire replaced before continuing to race. Q : Professor Motor has come out with an FK motor advertised as having identical specs as the JKHR (along with an apparently identical appearance, except for different laser(?) engraving). Does the IRRA® plan to accept that motor for submittal and/or add that motor to their approved list?